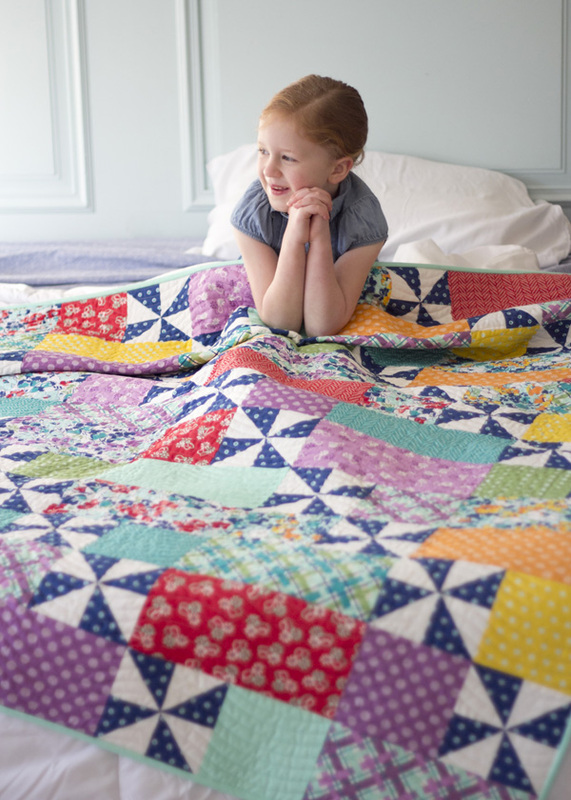 Sophie is such a trooper…always holding up quilts and posing for quilt photos. I’ll be helper-less next year when she’s in school! Ever since I released my Playful pattern a few years ago I’ve had oodles of requests for it in a larger size. It makes a great bed quilt size since it’s easy to put together, and honestly I’m not quite sure why I didn’t just make it in the larger sizes to begin with! So now I’ve re-released it with more sizes in this pattern. The blocks of the larger sizes are scaled larger, it includes 5 sizes, and uses fat quarters. This version is of course made up in Hello Jane fabrics. The two photos above were taken a day apart. One day it was sunny and the next day we woke up to snow. Kaitlyn quilted this one and did a lovely job! I also made up this version of the Celebrate pattern in Hello Jane. If you haven’t seen Nettie’s version of Celebrate you have to here…I love it in the muted colors. I quilted this one myself with my favorite (easiest) loopty loops. I always plan on quilting something more complicated and instead I come back to the loops! If you’ve never seen Lori’s free motion design tutorials you are missing out…run and look at how fun they are!!! I tried the footballs a couple of years ago and it was a hot mess….but I need to have another go because they are so fun! Love all of these so much!! 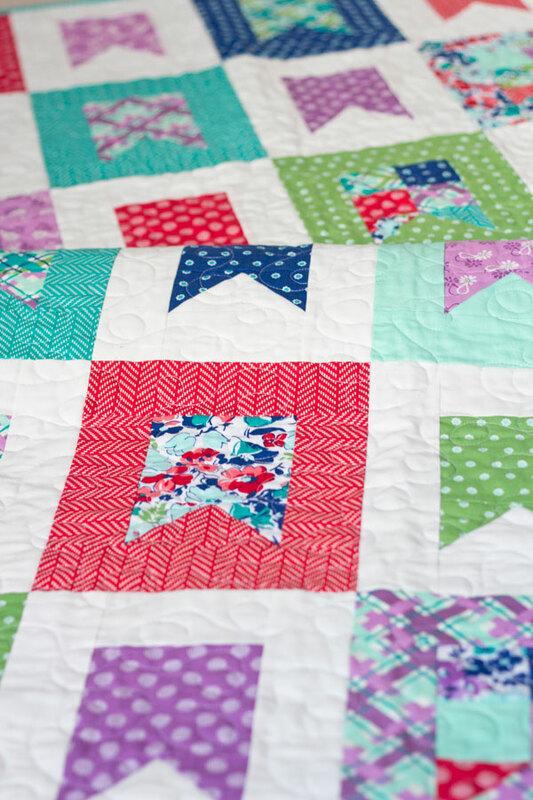 It’s so funny because I was looking at Nettie’s version of the celebrate quilt the other day and I loved it and love the scalloped quilting on it, I need to try that! Oh gosh, those tutorials ARE so cute! I’ve never seen them before, and I sure could use something besides figure 8s, loops, and wobbly lines! Thanks for the hot tip! You’re so sweet Helen! Yes Sophie is growing up…it’s so sad but so fun at the same time. She’ll be in all day school next year and my heart can’t quite handle it! I’m going to be a mess the first day of school…I’m already dreading it! Thank you and have a wonderful day! If I could only do your lovely loops as quilting, I would be very happy!! Love your new fabric!! Love your fabrics and patterns! I need to make the first one here for my granddaughter. She loves pinwheels. Thank you for all you do! Somehow, I love this new fabric line a little more each time I see it. That purple is the perfect purple to go with the other colors. And the plaid! My daughter and I each made a Playful Christmas quilt! We love them! Of course the pinwheels were in red and white for that special holiday pop. 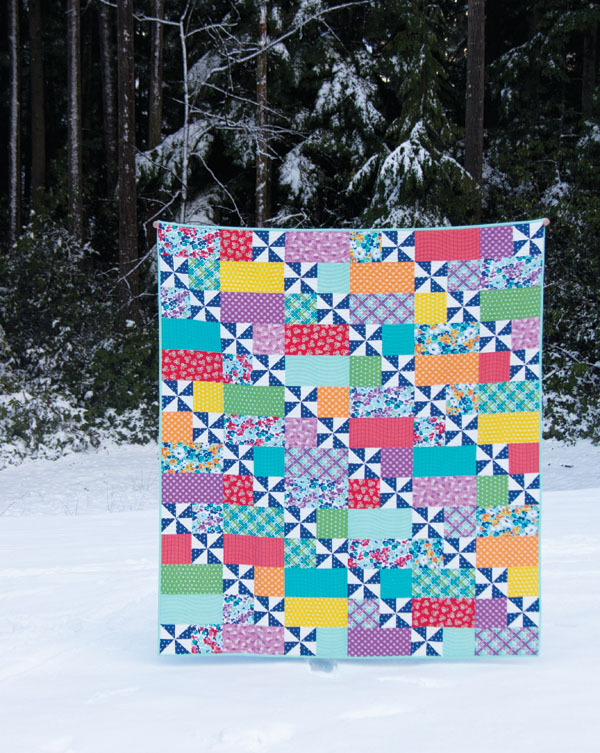 Oh now I’m going to have to make a Playful Christmas quilt! I don’t know why I never thought of that but it’s perfect for Christmas! Thanks for the idea! 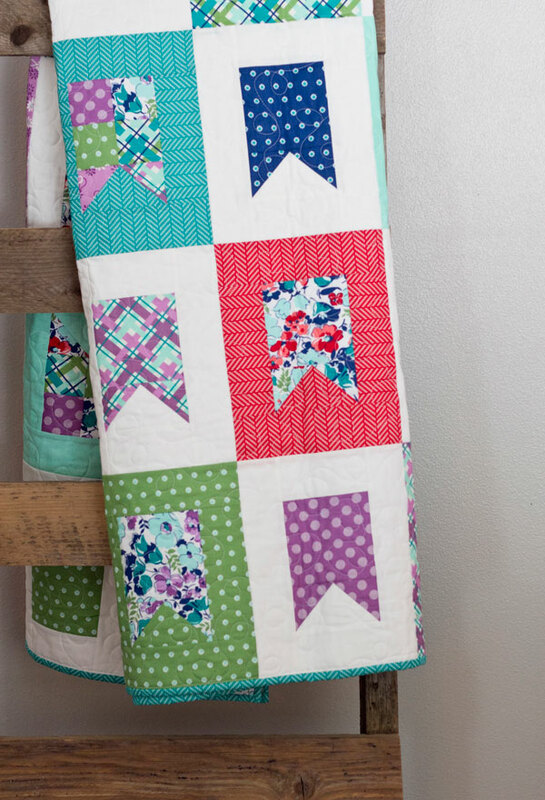 I really like your patterns and fabrics for these quilts…beautiful! I love this pattern! And your Happy Jane fabrics are sooo pretty! I am looking for a pattern for my daughter that is 43yrs old. she doesn’t like flowers and I am at my ends wits at what to make can some one give me a idea. Me too I love Pinwheels! 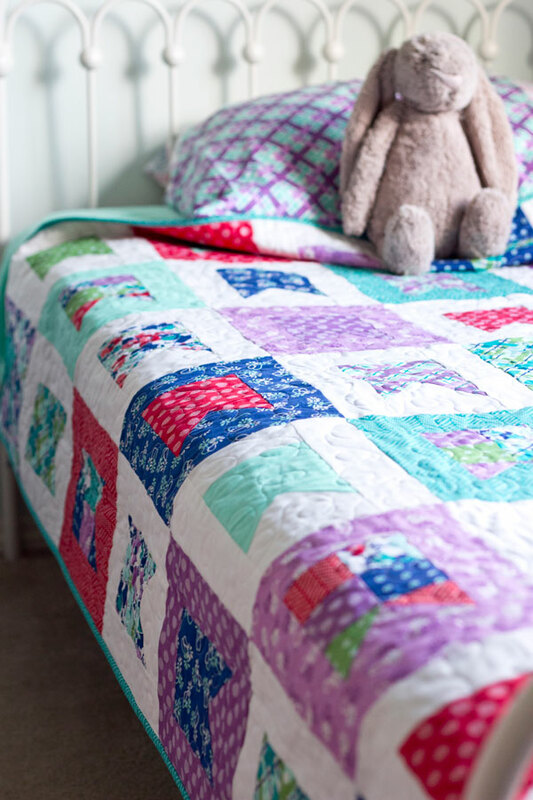 Just so you know this Playful quilt comes in a larger size too now, the pattern is Playful 2 and has more sizes! I am concerned about the pinwheels. 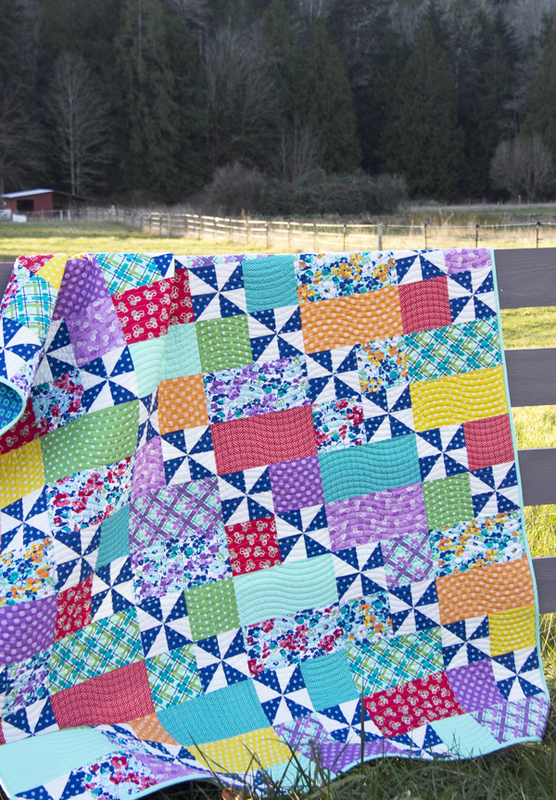 The pattern says to cut 3.5″ squares and when you create the pinwheel it will be 5.5 to go with the pattern. It does not. It is a 3.5 pinwheel using scant edges. I have now cut a few squares and wasted the fabric. I bought the end of the bolt for my quilt. Not sure I’ll have enough now. I am so disappointed for I searched your website for corrections for this pattern. Love the pattern but now $ wasted. If I’m wrong let me know. Please make a note to future quilters. Hi Teresa! There are no corrections to the pattern and the math is correct in the pattern, so you must be doing something wrong or missing a step. 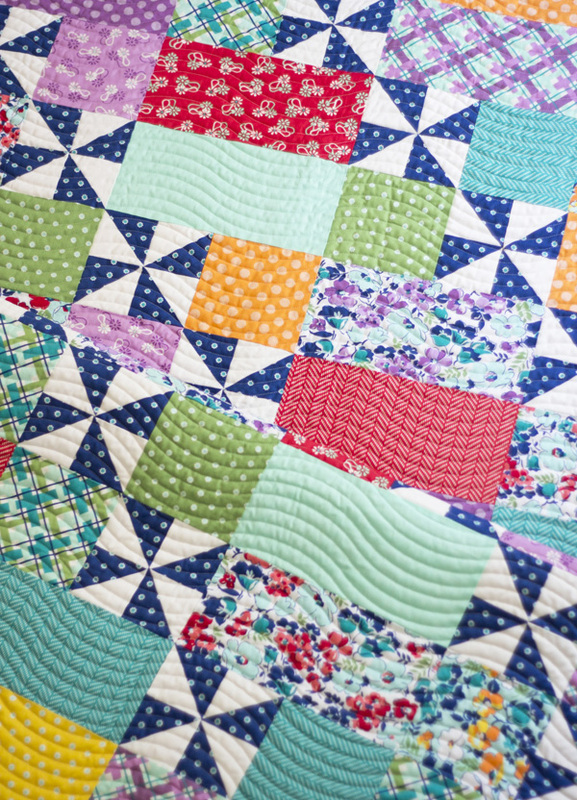 The pinwheels should actually be larger than 5 1/2″ when you sew them together, and then you trim them down to 5 1/2″. If you email me I can help you better, and try to figure out where it went wrong! Luckily I’ve seen this pattern made hundreds of times, so I know this one is correct!